Our Morning Glory Muffin Recipe is quite a healthy muffin recipe. The addition of pineapple and raisins to a carrot muffin recipe makes these muffins both good and good for us. It is a great way to get carrots into the non vegetable lover in your family. Lightly oil or spray 12 muffin cups or line with paper cups. Stir flour together with baking powder, baking soda, salt, spices and sugar in a large mixing bowl. Whisk egg in a medium sized bowl with buttermilk, oil and vanilla. Stir in pineapple. Pour into flour mixture and stir until just combined. Stir in carrots and raisins. Spoon batter into muffin cups. Bake 15-17 minutes or until a toothpick comes out clean. The trick to keeping this muffin recipe really tender, as with all muffins, is to mix the dry ingredients and the wet ingredients really well before combining them, then just mix them together enough to incorporate them. Over mixing will make muffins tough. I really like carrot muffins, but the first time I tasted them with pineapple added to the mix, I was really sold. These muffins are amazing. Sweet and delicious as well as quite healthy. A great way to get the kids to eat their fruit and veggies. Muffin recipes with buttermilk are also nice and tender. You can make these wonderful muffins even healthier by replacing all or part of the all-purpose white flour with whole wheat flour. It really does up the nutritional value. I do suggest though that when you bake muffins and cakes with whole wheat flour, just sift it first. Your baking will be nice and light. 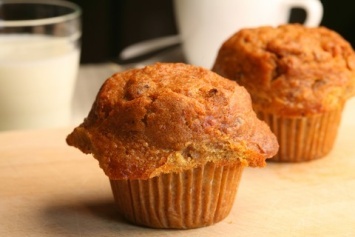 If you like this morning glory muffin recipe, you will love our other muffin and bread recipes. Find them all here. Nice healthy muffin. Baked up fluffy. Very nice flavor combination of the pineapple and carrot. I’ll make them again! I made these muffins and they were so dry that I threw them out and made a whole new batch using a different recipe. I definitely did not leave anything out and I did not overbake them. I did double the recipe which I don’t think should have caused a problem. The batter needed more moisture – perhaps if I had NOT drained the pineapple they would have been better.